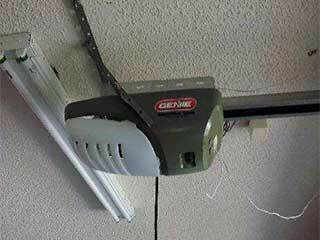 Are you tired of lifting up your heavy garage door or having to get in and out of your car to open and close it? Then let our experts help you. Our team at Garage Door Repair Puyallup can help you choose the right opener for your needs. We carry units of every type of drive-system, made by the industry's leading brands such as Liftmaster, Genie, Craftsman, and more. If you already know the brand or the model you want, we will gladly install it for you. Belt-drive openers are sleek and very quiet, but they can also be a bit costly. The belts are made from polyurethane, fiberglass or a steel-infused rubber, which helps in reducing their operational noise. If your garage is near a bedroom, you may want to consider investing in a unit of this type. Screw-drive models use a trolley on a steel rod in order to power the movement of your door. They are easy to use and maintain but a bit noisy. Chain-drive openers are the traditional older style type. They are economical and powerful, but also really noisy and a bit more bulky. Although each opener belongs to one of the three aforementioned types, the great variety that exists between the different models each brand has to offer can make homeowners who are looking to buy a new one a little disoriented. Our experts will gladly advise you on the benefits each unit has to offer, and make sure that you take every factor into consideration before making an informed decision. Once you choose the model you like, we will proceed with the opener installation process right away. Be assured that our team is well trained and will provide you with the best possible service and support. Between our annual visits regularly inspect every part of your opener. If you identify any problem such as strange sounds from the motor, issues with the remote control, the wall switch, or with the safety sensors, our team can fix or replace the damaged component for you quickly and safely. Remember, our team is only a phone call away.